The panelists involved in the session have extensive experience and were representing considerations from various fields of stakeholders. Marie Timmermann is a Senior Policy Officer at Science Europe addressing research funders and research performing organisations, responsible for various aspects of the Open Science agenda, research data and EU legislation. Timmermann pointed out that it is also crucial to make the business model clearer. There should be discussion about the EOSC post-2020 financing model already now. Some recommendations within the 2nd EOSC HLEG report have been considered already on post 2020 financing model. Dr. Tiina Kupila-Rantala, Deputy Managing Director at CSC, is responsible for EOSC hub strategy work. Tiina wanted to emphasize the stakeholder side. “Not only the bodies in the model are important but also the processes, workflows between the bodies are of crucial importance. Processes and workflows are actually more important than the bodies and therefore the processes should be defined well. She underlined “not to draw too tiny lines, because there are actually more important than the boxes”. Trust-IT Services CEO and 2nd EOSC High-Level Expert Group Chair Silvana Muscella, together with the other HLEG experts have finalized the final report published and launched at the EOSC launch during the Austrian Presidency of the Council of the European Commission on Friday 23rd November. According to her it is important to analyze who are the actual stakeholders and what is their role. 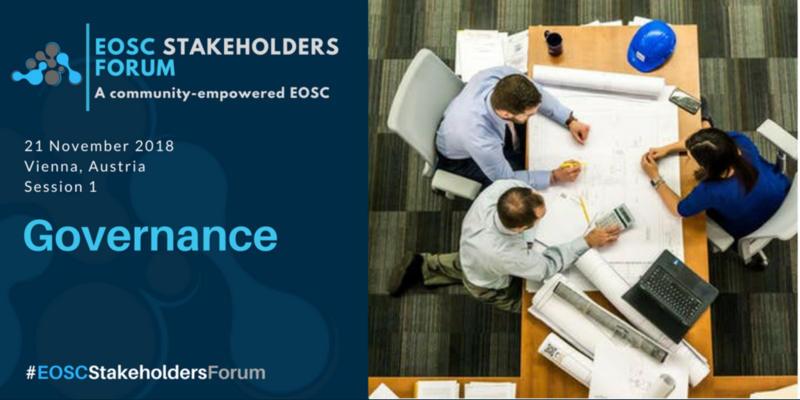 A user-centered approach is a key for EOSC to succeed, organically approached, together with the element of access to reputable and trusted data through peer review. Matthew Dovey commented that the structure of the ‘Executive’ group reflects the ‘Stakeholders’ group as the executive body is implementing the decisions made by the stakeholders. Openness is the key in the model, there shouldn’t be a closed community. Stakeholders need a wider role. The audience also posed quite a few questions and comments. There was significant discussion regarding universities and researchers’ role in EOSC. The president of Eurodoc, Gareth O’Neil and Lidia Borrell-Damian, director of Research & Innovation at the European University Association suggests EOSC is not well enough known among researchers so getting the universities and institutes involved, on a much higher level was considered important. Per Öster pointed out it is important to involve the researchers already in the building and shaping of the EOSC governance. During the current project, efforts have been made to reach out to researchers in order to get feedback on EOSC and governance model. Also EuroHPC was considered a relevant avenue of synergy to engage with where some needs could be capitalized on related to EOSC, an idea of having an HPC Working Group could be considered as well. The HPC does have its own very unique mechanisms so this may not necessarily be vital but a more articulated synergy going forward to help build the EOSC in Practice stories could be considered. Business plans are crucial and the funding after 2020 should be taken into consideration already now. Combination of Direct support Model & Cloud Coin Model.